Good afternoon, everyone! Sorry for the delay... some NASTY storms ripped through the Tri-State area yesterday and I was without power for a while. But now I'm back with a fun and funky design I tried out on Friday night. Using black and silver Stripe Rite paint and the dotting tool from It's So Easy, I was in the mood to rock some ladybug nails, but wasn't quite sure what to do. After experimenting around a little (with a few complete disasters), I finally settled on a manicure that I liked! These are my Ladybug nails! The thumb, which I struggled to get a good shot of, looks just like the pinky. I normally don't rock an accent nail, but I wanted to paint a ladybug and I thought it'd be silly to paint it over red. So silver seemed like the best option. Remember, you can visit the website at www.itssoeasynails.com for more information on the variety of products and retailers near you. Be sure to also check out their Facebook, Instagram at @ItsSoEasyNails, Twitter, and Pinterest pages! So what do you think everyone? Would you try this trend at home? I like the way those came out! 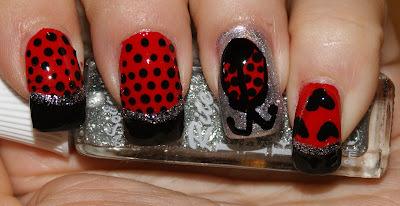 what a cute new way to do lady bug nails! too bad about the storm, very cute cute! i love it!